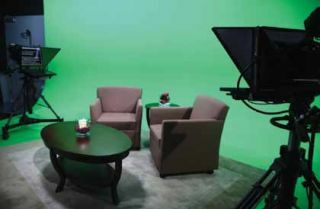 The NetApp Multimedia Group captures video content from from several venues on the campus of the company's corporate headquarters in Sunnyvale, California, including a 1,200-seat auditorium, a 300-seat theater, and a green-screen sound stage for compositing presentations and interviews into virtual environments. In addition, NetAppU, the company’s training group, captures and shares classroom video either live via streaming or recorded for on-demand training programs. All of the recording venues are connected to the corporate video production department via fiber-optic cable, providing real-time HD SDI feeds to ingest stations in a centralized video server lab. Each year the NetApp Multimedia Group produces more than 350 live events and nearly double that number of individual video productions for internal clientele. With little or no end in sight, the demand for services is continuing to grow year-over-year. To help keep pace with the demand, the company operates a multicamera production studio located adjacent to its postproduction environment. Configured with three Sony HXC-D70 cameras, this ever popular studio has a permanent green-screen hard cyc to help accommodate the increased throughput by utilizing three Ultimatte 11 chroma-keyers to create a virtual studio environment, which provides the added advantage of helping to keep the cost of sets low and physical storage to a minimum. Many of the productions are cut live using a Grass Valley Kayak switcher, with the switched program feed and three ISO-keyed camera feeds streamed and recorded directly to a storage system in addition to the raw output of three camera ISOs. The increasing demands of the studio were also resulting in an unanticipated secondary effect of an increased build-up of heat within the studio due to the studio lights running for extended periods of time. To combat these heating issues a supplemental air conditioning system was considered at a projected cost exceeding $100K. However, after a demonstration and test of some LED lighting fixtures from Litepanels, conducted personally by Pat Grosswendt, co-founder of Litepanels, the Multimedia Group decided to replace all of the existing incandescent studio lights with LED studio lighting. By using a combination of Sola 6 Fesnels and 1x1 panels, the teasm not only saved the originally projected $100K construction costs for the supplemental air conditioning, but NetApp is continuing to recognize significant savings via the greatly reduced power consumption of the studio lighting grid and reduced air conditioning utilization. In addition, they haven’t had to change a single studio light bulb in the past two and half years. Maintaining an agile transcoding and encoding solution is critical to reaching an ever-increasing array of devices. With the storage system in place, up to eight streams of HD SDI content can be captured and made accessible to the entire work-group simultaneously from across the NetApp campus. This ingest process is a fully automated and integrated part of the Primestream FORK Production Suite for media asset management and workflow automation. For NetApp, Primestream FORK’s key role is managing the ingest process and providing a centralized media management system across the six edit stations, with features and capabilities that help reduce overall turnaround time. For example, team members can browse and access content via a lightweight client from virtually any machine that has been granted access, so they can easily find any media in the system. Each element includes a proxy file, so any editing or marking done within the system is nondestructive to the original full-resolution media. This proxy workflow also allows users to preview, log, and create rough cuts with reduced impact on the network, and, in combination with Adobe’s Creative Cloud editing environment, the team can work far more collaboratively and efficiently than ever before. The six edit stations are connected to the E-Series storage arrays via Fibre Channel, which enables the editors to start editing almost immediately and guarantees no dropped frames regardless of the bit rate. Plus all of the edit stations can access the same content concurrently, so different editors can work on different parts of the same project simultaneously. This shared workflow has shaved up to 70 percent off of project turnaround times. Defining and faithfully maintaining a comprehensive and logical structure to metadata is the key to content discovery. After the Primestream production MAM creates proxy files of the ingested content, NetApp editors enter predefined fields of data describing the production. This allows employees around the world to search and play back low-res content quickly before downloading high-res files. Maintaining an agile transcoding and encoding solution is critical to reaching an ever-increasing array of devices. This is accomplished using Video Hub, NetApp’s internal video repository and distribution solution. Video Hub is built on the Qumu online video streaming and content management platform, which integrates Telestream’s AnyStream product to transcode and deliver video programming to a wide range of devices. Using the Qumu Web interface, user-generated content can be encoded and posted without going through the traditional production workflow. A proxy workflow allows MultiMedia users to preview, log and create rough cuts with little impact to the network. The Qumu VideoNet Edge solution also creates a secure, fault-tolerant video delivery network with advanced streaming and caching features, ensuring that every employee in the NetApp globally distributed workforce can easily view live webcasts. A 10 TB portion of a NetApp FAS6000 series storage solution supports the delivery workflow. The Qumu platform provides centralized security, search, and playback of the entire library of NetApp’s corporate videos, and it also encodes and posts NetApp’s live and on-demand webcasts. The Qumu platform also provides additional social media capabilities such as commenting, rating, and surveys; and can accept, through approval processes, “unofficial” content generated by NetApp user groups. In addition, Qumu’s detailed metrics and analytics help executives to view and analyze trends, plan and develop new programs, and track compliance for any “must-view” programming. And of course metrics are crucial in helping the group reflect ROI and justify future expenditures. The new production and media management setup was specifically designed with ease of use and productivity in mind, and that meant maximizing all of the available systems to create the most efficient workflows. The operation had to be flexible without being overly complex so that people would be able to learn on the job. The idea was that a new person with a good working knowledge of media communication workflows could become proficient enough to operate the system alone within two or three productions — and that’s exactly what they got. The NetApp Multimedia Group’s new production operation marries the benefits of shared storage with the capabilities of advanced broadcasting products and technologies. The result is an infrastructure and workflow that allow the team to produce more content in less time, make the content available on more devices, and ultimately showcase how flexible, reliable and fast systems are becoming crucial requirements in managing and protecting large video libraries for corporate video communications departments everywhere. Mike Tyler, Ed Cho, and Bart Saunders are part of NetApp’s Multimedia Group.